A new range of Loadall telehandlers promising fuel savings of up to 15 per cent has been released to the local market by JCB Construction Equipment Australia (CEA). 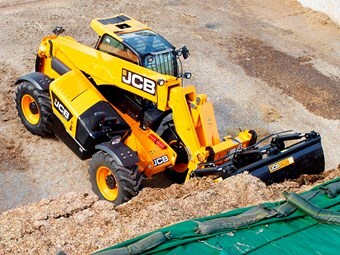 The JCB 541-70, one of the new Loadall telehandler models. According to JCB CEA National Telehandler Product Manager Greg Sealey, the improved fuel efficiency comes partly from the use of the company’s new EcoMax T4i/Stage IIIB engines, and partly from an improved regenerative hydraulics system that reduces the boom retraction and lowering time. To ensure the new line was equipped to handle Australia’s harsh conditions, several units were trialled with customers prior to the decision to offer the upgraded machines nationally. "The feedback we have received from those trials is overwhelmingly positive towards the upgraded machines," Sealey says. "Initially customers weren’t too concerned with fuel economy, but with reports of savings from 10 to 15 per cent and no loss of power, they really started to see the benefits." He notes that the overall ease of use of the machines is also a selling point. "The gear selector is on the joystick now, making it a lot easier to operate," Sealey says. "And the Smooth Ride System is also easier to use as it can be engaged with the boom in any position, automatically engaging when travelling above 7 km/h." The hydraulic pipes on the lift/lower and extend/retract circuits have been increased from 1/2in to 5/8in BSP, which JCB says reduces pressure loss and increases efficiency. A pressure release switch in the auxiliary circuit allows venting of the front or rear auxiliary functions, reducing the time taken to change attachments. Hydraulic damping is now standard on the boom extension and lift functions and assists with load retention while also improving operator comfort.